Stretch out and put your feet in the wind. Ideal for taller riders, this kit converts the standard FL Softail® footboard controls to Original Equipment FX Softail® style forward controls. 33909-08A fits '07-later FLSTC, FLSTF (except FLS and FLSTFB), FLSTN, FLSTSB, and FLSTSC models. Requires separate purchase of appropriate footpeg kit. 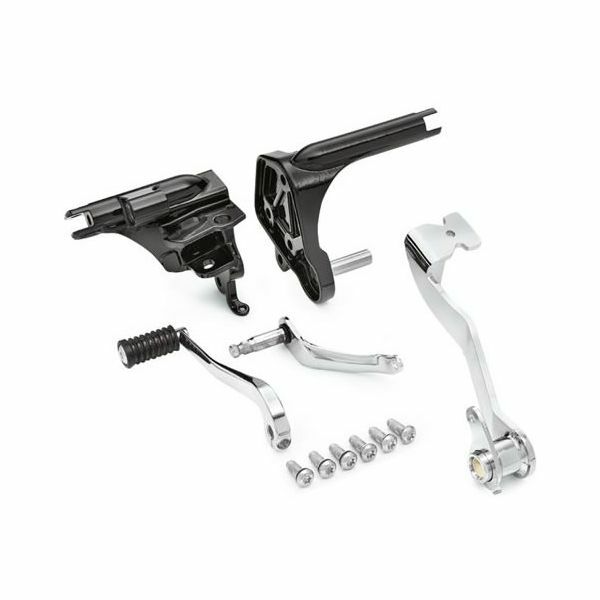 Compatible footpeg kits for FLSTC and FLSTF are P/N 50305-02, 50359-04, 50370-04, 50474-03, 50500-03, 50506-03, 50576-05, 50695-08, or 50935-07. FLSTN, FLSTSB, and FLSTSC models require separate purchase of stock FXCW footpegs with wear pegs (P/N 51327-08 Left Peg, 51323-08 Right Peg and 33130-07A Wear Peg (qty2)). Does not fit with Profile Low Suspension.